Rookery Waters winner Martyn Freeman. There was a good turnout for the Saturday £1,000 qualifying open match at Rookery Waters fished on the Magpie Pool. It turned out to be a real battle for the top spot between Martyn Freeman and venue expert Mark Pollard. Freeman took the honours with 133lb 4oz, most of his fish caught shallow and then late on in the margins. Runner-up and fishing opposite the winner was Pollard who started slowly before having an exceptional last two hours catching shallow to the lily pads from peg 27 for 130lb 6oz. 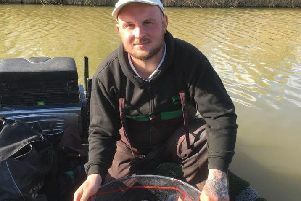 In the Thursday £1,000 qualifying open on Magpie Pool, the winner was Ben Townsend with 158lb 10oz from peg 33. Runner-up from peg 22 was Vinny Easy with 139lb 14oz followed by Tom Cole on 131lb 10oz. The Wednesday Over 60s match on the Jay Lake saw Tony Watling put together a very impressive 148lb 8oz of carp up to 3lb and lots of brown goldfish and F1s from peg nine to take the honours. Second was Chris Saunders with 87lb and third on 83lb was John Belshaw.